SNAFU! : China should reinforce “deterrence facilities” in the South China Sea? China should reinforce “deterrence facilities” in the South China Sea? China should reinforce “deterrence facilities” in the South China Sea as the United States and its allies mount a bigger challenge in the contested waters, a prominent Chinese specialist said. 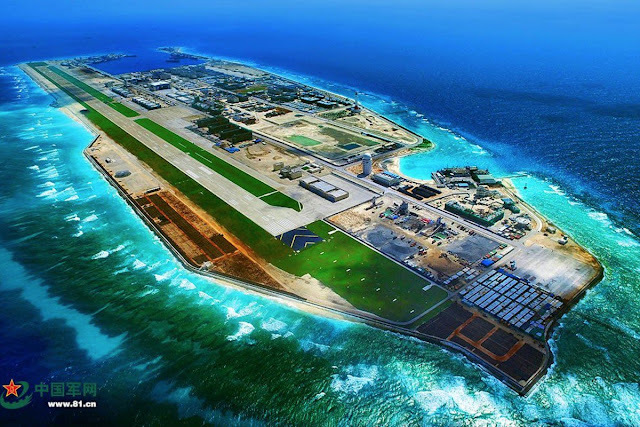 “Tension in the South China Sea will rise in the coming year so we must deploy some defensive facilities that are able to overawe American warships entering nearby waters,” said Wu Shicun, head of the government-affiliated National Institute for South China Sea Studies. On the sidelines of the Boao Forum for Asia in Hainan on Friday, Wu said the US would step up what it called freedom of navigation operations in the area with more frequent and wider-ranging manoeuvres this year. “The Americans feel that they alone are not enough. They might also bring in allies such as Britain, Australia or Japan for exercises, or even create a regular joint action regime,” he told the South China Morning Post. I chuckle at this story. First it proves what I've been saying. We don't need to worry about China's Anti-Access/Area Denial scheme. We're ALREADY there (although in light of my feelings toward Chinese troops in Venezuela it does give me pause...big boys play big boy games...maybe expected in light of super power games). Next. This bubba that got interviewed just dropped pants. In essence he told us which of our allies he fears. Australia and the UK...even Japan. That is illuminating. It also puts a light to their view of S. Korea. They're not listed. Is it because they feel that they'll push a neutrality stance? I didn't for one second expect Singapore to be listed. Other states with potentially hostile feelings toward China either...countries like Vietnam, or the Philippines. The reality is clear. China is itching for a fight. They don't feel like they're ready yet and that's to be expected from a cultural perspective. If attacked they will defend like madmen. If on the attack they will wait until victory is assured (unless another event forces their hand and considerations are tossed). We have a bit more time if we go alone. We have at least a decade or more if Australia, the UK or Japan make it clear they will fight with us.